Vyasa Purnima (Veda Vyas Poornima) or Guru Pournami is one of the most auspicious purnima days as per the Hinduism. In 2017, Vyas Purnima or Guru Pournami date is July 9. Some scriptures described that on Ashada Poornima day, Vyasa completed writing and editing the compilations of Chaturvedas. Thus, Ashada Poornima is also called as Vyas Poornima. Sage Vyasis the presenter of Chaturvedas (four Vedas), Astadasha Puranas (18 Puranas) and the ithihas Mahabharata. Vyas Purnima is also observed as Guru Pournami because Veda Vyasa Bhagwan is considered as the Aadi Guru (first teacher). During Vyasa Jayanthi people worship Veda Vyasalong with Guru parampara and Lord Sri Krishna. In some regions, the day is also celebrated as Guru Puja. In some sects, on Vyasa Purnima is considered as the beginning of Chaturmas Vrata. During the four holy months in Hinduism, Lord Vishnu goes into sleep. Some Shaiva sects observe Vyasa Jayanthi as the Shiva Shayanotsav Vrata arambham. It marks the first day of Shiva Shayanotsav Vratam. On this day, Shiva Dolotsav is also celebrated. In Veda Vyasa temple at Basar where Goddess Gnana Saraswati Devi temple is located, Vyasa Pournami celebrations are held with utmost devotion. 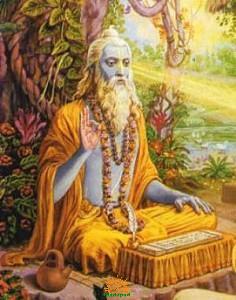 Worshipping Veda Vyasa bhagwanand observing Vyas Purnima with reverence is highly meritorious. The one who donates Vishnu Purana on Ashada Purnima would attain salvation and reaches Vaikuntam, the Vishnu lokam, after the death. Reciting the stotra of Veda Vyasa on Vyas Pournami routes the devotee to Brahmatva (salvation). Lord Shiridi Saibaba said that Guru Purnima is the compulsary festival that his devotees should celebrate. In 2016, Vyas Purnima or Guru Pournami date was July 19. In 2015, Vyas Purnima or Guru Pournami date was July 31. In 2014, Vyas Purnima or Guru Pournami date was July 12. In 2013, Vyas Purnima or Guru Pournami date was July 22. In 2012, the date of Vyas Purnima or Guru Pournami was July 3.
why because vyasa purnima guru purnima in telugu words?